The first step in identifying duplicates and developing a catalog of standard, preferred parts is to access all parts from all engineering systems and projects. 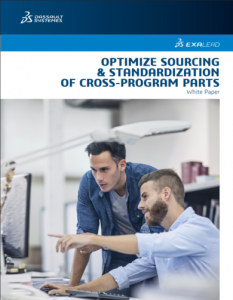 Because it was designed for heterogeneous engineering environments, Sourcing & Standardization Intelligence on the 3DEXPERIENCE platform leverages indexing technology which can crawl information systems silos to create a comprehensive data set focused on the primary element—the part. It includes aggregating data from ERP and SCM systems with data from engineering systems to break down one of the most important barriers to reuse and smart sourcing, bringing together business and data information at the same place. Once it accesses CAD models, the Sourcing & Standardization Intelligence index extracts any relevant information, from the size or the technical characteristics, up to the geometrical features. It is even capable of computing a unique digital signature leveraged for similarity search. This does not require investments in changing the current infrastructure, as index crawling technology does not require changing authoring systems. Once ecosystem data has been indexed, the OnePart Reduce application on the 3DEXPERIENCE platform uses advanced machine learning to enable parts to be organized and duplicates identified at scale. An algorithm is first used to cluster parts based on 3D shape similarity, geometrical features, and semantic criteria (name, weight, material, etc.). All the clusters are displayed by highlighting the ones with the most duplicates or, when price has been associated with the part, those with the highest potential cost savings benefits. Thus, product data managers and/or sourcing professionals can then use OnePart Reduce to identify and tag preferred parts and associated vendors. Last but not least, these decisions are pushed to the OnePart Reuse application, which will guide the designer to promote reuse according to the company standardization policy. To ensure the catalog stays clean and to prevent future duplication, OnePart Reduce can be run regularly to identify newly created parts belonging to a named classified cluster, and therefore alert for possible deviation from the standardization process.